On December 15th, the Fed met and announced that there would, in fact, be a rate hike to close out 2015. Much like when they met earlier this year, we pulled Marksman data to again see how the market reacted in the ensuing month. As the data suggests, after a short initial rise in rates at the beginning of the 30-day period, rates are actually seeing some decline. 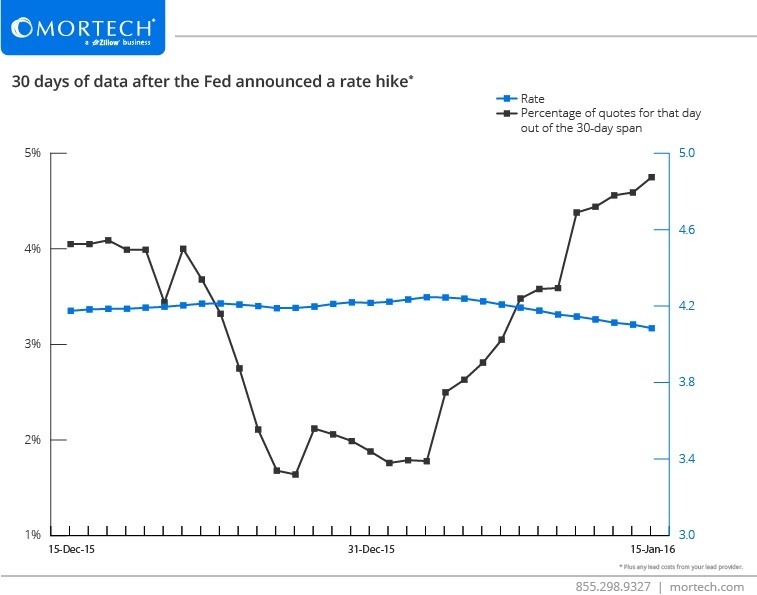 This is opposite of the response we saw in the September-October timeframe after the last Fed meeting, when rates initially dropped but then steadily began to climb back up. Mortgage quote volume saw a large dip about a week into the period, which makes sense considering most borrowers were likely waiting to see how rates would trend with the announced hike. As rates began to decline, mortgage quotes shot back up so that the largest percentage of mortgage quotes over the 30-day period was at the tail end, rather than right after the hike was announced. There’s currently no indication that the Fed will announce any future changes to rates at their next meeting, and if that remains true, rates could continue to see some slight decline despite the announced hike, and mortgage quote volume could continue to trend upward. As mortgage quotes keep moving in a positive direction, it’s important to have the most accurate rates online. Find out today how Mortech and Marksman can put your rates online to millions of potential borrowers each day, and help you close more loans.